Sjón’s last novel translated into English (and indeed his first novel translated into English), The Blue Fox, was Scott Pack’s favourite book of 2009. I read it on his recommendation, and liked it, but somehow it slipped through the review net and I never wrote about it here. I wonder now if that ‘somehow’ might have included a frustration at working out how to represent the strange story. It’s a feeling that recurred when approaching this review. From the Mouth of the Whale (2008, tr. 2011 by Victoria Cribb) is Sjón’s most recent novel, and the English title varies significantly from the original, Rökkurbýsnir (Marvels of Twilight). It is a delight and a wonder, a barking mad story which detached me from my expectations and entwined me in the narrator’s ridiculous charm. As the book begins all we know is that we are in Iceland (“this unlovely splat of lava in the far north of the globe”) in the 1630s, listening to the – what? narrative? ramblings? – of Jónas Pálmason, who likens himself to a sandpiper as he lies in exile on an island, slandered and attacked by “villains” and “tyrants”. “Jónas is a rogue, Jónas is a sly, disreputable fellow, Jónas is a braggart, Jónas is a liar, Jónas is a foolish dreamer…” There might be some truth to these charges. As he languishes on “this bird-fouled rock, this dance-floor of seals”, Jónas lets us into his thoughts. Are they eccentric, or just ahead of their time? He collects birds’ skulls, seeking a stone he calls bezoar, “that could heal all human ailments.” He recalls his time as a child healer, laying hands on female private parts to diagnose conditions (“…thus I read together book and woman…”). He steps, sideways and surreptitiously, toward the whole of his story. Frankly the eccentric and piecemeal way of telling which Sjón – or Jónas – adopts, makes it a challenge both to unravel the truth of his story, and to represent it here. “When a thing is classified correctly,” Jónas says when cataloguing elements of natural history, “it is tamed.” This book is unclassifiable and untamed, wild and joyful in its telling, and in its bonkers cobbling together of myths, cultural history, science and religion to make a dazzling literary patchwork quilt. Meaning seems less important than feeling, and Jónas’s love of knowledge and intellectual investigation drives his story and his way of telling. He is writing before the Enlightenment, and his ideas challenge the status quo and anger the authorities: “sorcery” and “necromancy,” they call it. His style has a joyous physicality, throwing the reader into the vivid life in the pages, such as a description of a ‘walking’ corpse, or the aforementioned ‘reading’ of women’s lower abdomens. Inevitably these do not bear extraction, because the cumulative effect of Jónas’s voice is what makes it so remarkable. In the middle of the book is a section called ‘Kidney Stone’, which gives us a calmer, third person narrative and offers hope for Jónas, as he travels from his exile to Denmark, and is taken under the wing of a scholar known as Ole Worm. This gives us more evidence of Jónas as the seeker after truth, as he investigates the local trade in unicorn horns, but finds that his enemies have not forgotten him. Later, the narrative returns to his own rolling, tumbling voice, and he tells us more (though not as much as we might expect from the cover blurb) about the deaths of his children (“one never becomes used to it”) and his wife’s love (“the terrible thing is that her loyalty is misplaced. I have done this woman nothing but harm”). The lively nature of Jónas’s narrative sacrifices emotional involvement. “Every book is imbued with the human spirit,” he tells us, when speaking of how burning a book is as bad as burning a man. There is more spirit than most in From the Mouth of the Whale, and I can only emphasise that you should not be put off by my difficulty in conveying its mad charm. I did wonder at a few of the choices near the end, such as on the last page of his narrative, naming Jónas’s place as somewhere calculated to bring forward connections in the reader’s mind with another famous island exile. And the epilogue, from which the English language edition takes its variant name, seemed to subtract rather than add. Nonetheless, the sheer fizzy delight – a new type of literary pleasure! 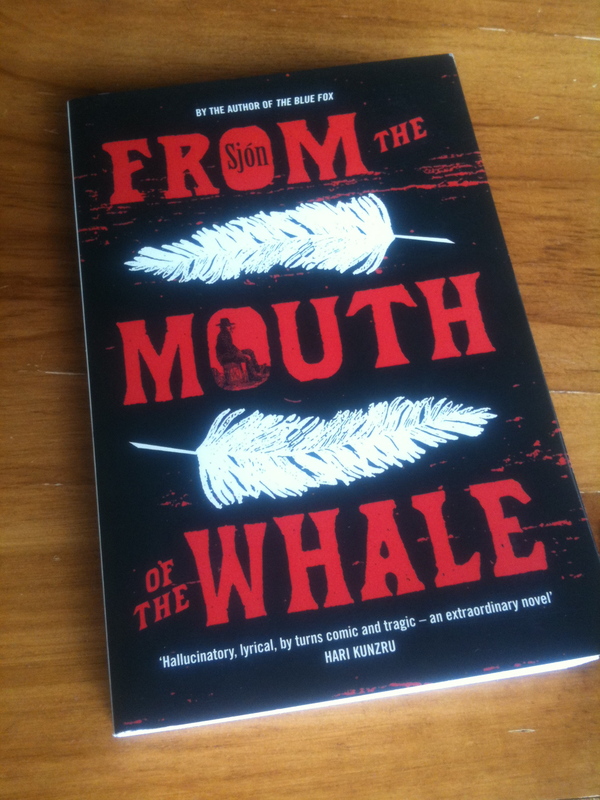 – in reading this book made me curious to know why none of Sjón’s other five novels has been translated into English. What riches await us? I’ve ordered one – the fact that I’m not entirely sure what to expect, really, despite this fine review, makes it all the more intriguing. Not an easy book to write about is it?! I’m really pleased you were as bowled over by this one as I was, and as buffeted by it too. I hope the lack of comments is simply because people are too busy ordering a copy of their own. Forgive the plug but the author will be appearing at our Firestation Book Swap in Windsor on August 18th. I can’t wait to meet him. Is Sjón a contemporary Icelandic author? It clearly is a difficult one to describe. I’ll keep a look out though. It sounds unusual, and unusual is often welcome. Oddly enough I’ve heard of bezoars. If nothing else growing up playing games like D&D is tremendous for getting an education in obscure folklore. And polearm classification. This sounds great, I love things that are a little off-kilter. The only Icelandic book I’ve read is Under the Glacier by Halldor Laxness. That was pretty strange too, strange but good. Yes, he is. A poet, mostly. I read The Blue Fox and thought it was excellent. Will be searching Dublin for the Whale.